With its four towers and impressive façade, the mighty castle stands proudly on the shore of Lake Mälaren. And within these thick walls lies one of best-preserved Baroque interiors in Northern Europe! Count and Field Marshall Carl Gustaf Wrangel had the castle built on the estate where he was born: Skokloster. The location, right on the waterway between Stockholm and Uppsala, was perfect for someone who was keen to make his mark with an impressive palace. The cornerstones were put in place in 1654, but by the time of Wrangel’s death in 1676 the castle remained uncompleted. In the banqueting hall − which was later to become known as the Unfinished Hall − the craftsmen downed tools and left when they learned of the Count’s death. Those tools are still there to this day. So much has been preserved due to a ruling in 1701 that the castle collection should never be split up. Later lords of the manor also left their mark in the form of rooms and objects − furniture, paintings, textiles, glass, porcelain and weaponry. 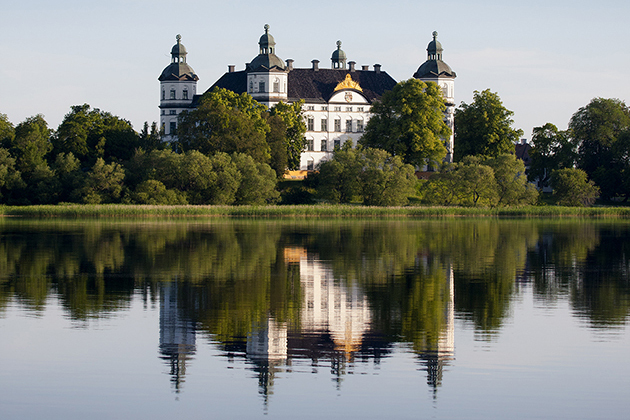 350 years after Wrangel’s death, Skokloster Castle remains the largest private palace ever built in Sweden. The 78 rooms house 50,000 artefacts from the 17th, 18th and 19th centuries.